This is one of my last images of my beloved dog, Princeton. I wasn’t able to get very good photos of him because he wasn’t the ‘posing kind of dog’. He would move every single time I went to click the shot. So I’m lucky to even have one decent photo of him. Last March, he had a stroke and I had to make the heartbreaking decision to have him euthanized. I am still grieving. When I decided I wanted another dog (years ago), I went to one of our local animal shelters. I saw this poor dog, about 2 years old, who was very badly emaciated, along with being very ill with an upper respiratory infection. I adopted him on the spot and immediately took him to the vet where they kept him on an IV overnight. He turned out to be a wonderful companion. He would ride in the back seat of my car and stick his head out the window while his ears would flew in the breeze and he just loved it. That was one of his favorite things to do. Children who saw him riding in my car always got a kick of seeing his flying ears. Having to let him go was excrutiatingly painful. Today, I am sharing the memory of my beloved pet, Princeton, on Michelle’s (Hope* the happy hugger) Pet Share. No, we never stop missing them. The pain gets easier but there is always a place in our hearts. And your comment just brought tears to my eyes. He was a wonderful wonderful dog. Yes, they do always have a place in our hearts. Sorry about the tears. Big hugs! He looks like a lovely sweet little doggie. I’m glad you had some good years together. Thank you so much. We did. He was a great companion. 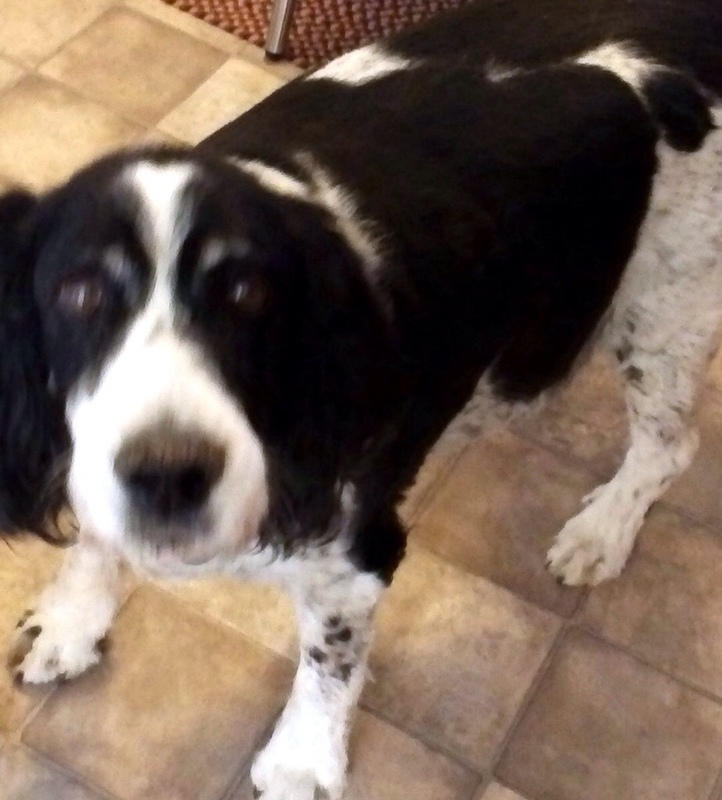 He was an English Springer Spaniel (100%) and whoever got rid of him lost a diamond. Thank you for sharing not only your picture of your wonderful dog but sharing your heart with us. Grieving is hard to walk through and I’m sure you miss him so much. Saying a prayer for you. Thank you Anna. I appreciate that. I do really miss him. Hoping I will see him again one day. What a sweetie! I share your loss! I had a Springer-Aussie Shepherd mix named Oreo. He looked very much like Princeton, and he wasn’t much of a poser, either. I still miss him, too. Thanks for sharing this sweet doggie! I don think it makes a difference when you lose them, all pets are difficult to lose. Sorry for your loss. Thank you Mandi, and yes, you are absolutely right about that. So sorry for your loss. It’s always so hard to lose a beloved pet. What a gift you were to him, and him to you for the time he was with you. Thank you Terry! You are right. We were both gifts to each other. I loved him and he dearly loved me. He was the sweetest dog but I think he would have protected me if he needed to. Thank you Jodi. Yes, I loved him a lot. Dogs that are rescued, I think, know they have been rescued and they are loyal to you and love you down to their dying breath. They don’t take having a good home for granted. In the car that I had when I first got him. He had his head stuck out the back window when I turned the corner. Suddenly someone started getting my attention and pointed behind my car. He had fallen out the window and was running as fast as he could to keep up with me. It scared the HELL out of me. I got a new car and he couldn’t fall out of that window. That happened when he was about 2 years old. I am so grateful he didn’t get hurt. Oh that is awesome that Mikey is also a rescue! I know, to them, we are the greatest thing that ever walked this earth. They love us unconditionally. I personally believe that my pets will be in the after life and wait for us there (along with all of our loved ones). In fact, I get this feeling that Princeton is with my beloved grandmother and she is loving him and waiting for me to get there. (My other pets too that have passed away). I guess I believe that because it makes it a little easier to say goodbye to them. It’s really hard to do isn’t it? We both did the right thing for them. I know that. I am grateful to have gotten to have so many years with him and show him that some people are really good and loving. I remember your lovely posts about Princeton then, PJ, and I loved how he gave you all the great companionship and love you needed. I was sad with you, too, but you did what you had to for your beloved dog. Hooray for all the great years that you and Princeton shared, my friend. Oh, I am so glad you have this picture of Princeton. He has such a sweet look in his eyes. It is so hard to lose a pet. They are truly family and I believe we will see them again too! Pets are surely precious gifts! He is a handsome fella. I know you were both blessed to have each other. Sending you hugs. Awe, Joy, it is heart breaking, I know, but we do heal through allowing ourselves to grieve. I agree with you Cat. It is healthy to grieve. I miss him but I’m not really “grieving” anymore. Thank you for sharing that with me Cat. I am so sorry you lost your beloved cats and so sorry that it was so painful for you. I personally believe that our pets go to the afterlife and wait for us. I think that is one way that helped in my grieving with Princeton (and other pets). Heck, I understand that your cats meant more to you than humans because sometimes I feel the exact same way. Well… right now I DO feel the exact same way. I have been nothing but hurt, abused, manipulated, and stabbed in the back by the humans in my life. My beloved pets never did anything but love me unconditionally. It was and is still very hard on me that my beloved cat was stolen from me over a year ago. I know she was stolen and given to someone who lived in the country and needed a barn cat. She was an excellent mouser. It hurts me a lot that the people that did that were suppose to be my friends and members of the church I was going to (not anymore. I left the church). I think it is very sweet of you to light candles for your kitties. I see nothing wrong with that at all and especially if it makes you feel better. Thanks for sharing this story about Princeton. Our dog just died today. Some day I will write about her. Right now I’m too weepy. When I had to put my Princeton down, after a day or two I decided to do an Eulogy on WordPress on him and it honestly did help ease my grieving because it was a comforting thing to do. Just thought you might want to do one for your puppy. Aww, 10 years is a long time to know someone and then have them gone. Sorry for your loss PJ ❤ . Thank you Ameena. I miss him, but he had gotten old (for a dog his size). It didn’t surprise me when he had that stroke because of is age. What a beloved face! He was quite handsome! Yes they do. Princeton has a place in my heart. 🙂 How is Utah doing? I sure hope he is 100% improved. I think, he is doing better each day. I will feel better once I take him off the Prilosec, and see how he does. Thank you for asking! I’m happy to hear that. I was so afraid it wasn’t going to be good news. I hope he is able to go off the meds and does well. I agree — a couple of weeks ago, I really felt he was going to journey over the Bridge! Fortunately he is doing better now, that is good news. Sounds like he must have some Reflux issues if he is on Prilosec. Poor guy. I hope that gets resolved. He is on massive doses (human dose 20 mg/once a day — his dose 40 mg/twice a day) … treating for duodenal ulcers or a bandaid for ______! Poor thing! I hope they heal whatever it is that is causing his problems! If I remember correctly, they tend to constipate you. I hope they have caused that problem. I am so glad they have medications that can help the dogs even if some of the medicine is for humans.